There’s a lot of excitement swirling around The Witcher nowadays, and for good reason. Henry Cavill was cast as Geralt in the Netflix series, author Andrzej Sapowski released a second Witcher novel in two years back in May and we’re coming off the success of The Witcher III: Wild Hunt. With any popular series, there’s been controversy as well. Recently, a casting call went out for Ciri, and it wasn’t as the pale white girl made famous by the novels and games. Secondly, author Andrzej Sapowski decided it was time to file a lawsuit against Witcher game series developers ,CD Projekt Red, for over $16 million dollars in royalties following the success of The Witcher game series. On a side note, this prompted author Brandon Sanderson (Stormlight Archive, Mistborn series) to give CD Projekt Red rights to his Mistborn series to create video games, citing the exposure alone would be well worth it. That being said, recent casting news had come out giving us our new Ciri, Yennefer and more. This was the tipping point for me, I wanted to explore The Witcher III again, while I have some time before Smash Bros. comes out. In recent years, I’ve played a lot of open world games similar to what The Witcher III offers. Some of those include Fallout 4, Breath of the Wild, Horizon: Zero Dawn, Skyrim and more. I’m noticing more and more that these games have a similar formula. There’s a strong start to the narrative and experience, followed by a fleshed out starting area which leads to a large world to explore. Most of the time, you explore the world and realize that a lot of it is surface level. That deep starting area with great characters and dialogue are nowhere to be seen in the rest of the world, exception being story progression areas. With these types of games, I expect as a gamer to be rewarded for things like exploration. I know that there are criticisms of Breath of the Wild’s Koroks, but I had more than a dozen moments of just messing around, not expecting anything, just to have a Korok pop up for the weird thing I just did. I recently played through Horizon: Zero Dawn and after a strong start, I felt relieved to be done with the game. There isn’t much reward for exploring in Horizon. You can’t find weapons or armor out in the wild, which means at most, you find a cache of machine parts; the same machine parts you receive for every enemy kill you make in the game. On top of that, no one in the entire Horizon world sells animal meat or pelts, which is very strange to me, but that’s a different article to write. What I’m leading to, is that out of the recent open world games I’ve spent over one hundred hours playing, The Witcher does the best job at world building. It’s incredibly difficult to give every single person you encounter in a game a unique set of dialogue or personality and I don’t think we are at the point to expect that sort of treatment yet. 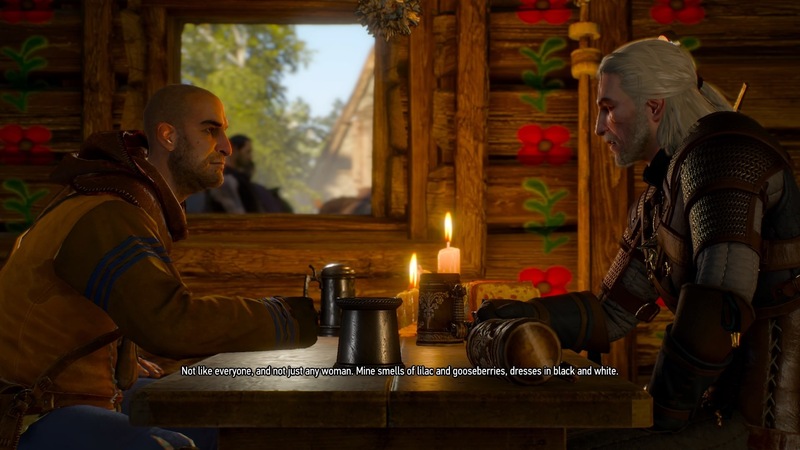 The Witcher is no exception to having stock dialogue for many of its citizens you encounter, but it feels different here. One aspect I was thinking about before jumping back into The Witcher was that I remembered a lot of the characters, story beats involving them and their personalities. I just played Horizon and I can’t name more than half a dozen characters while my last save in The Witcher was from June 2016. 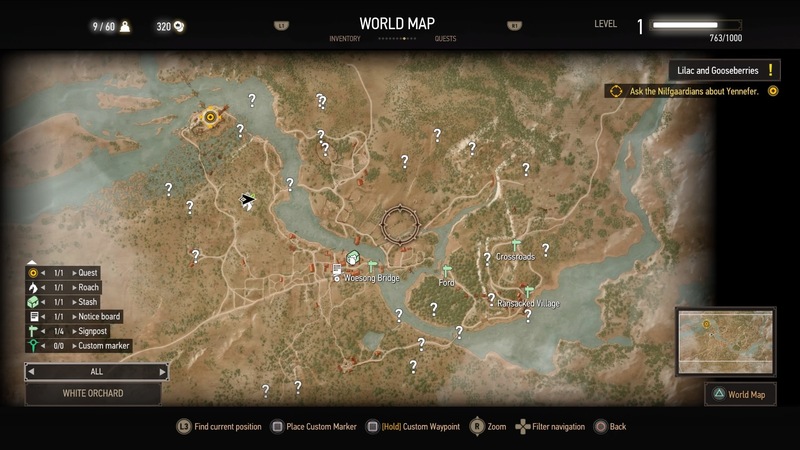 In terms of exploration, The Witcher excels beyond games like Horizon because you find unique items everywhere ranging from weapons, armor, blacksmith plans and more. Even though you are halting story progression to explore the world, you subsequently are progressing as a character because you are improving yourself with the items you find while exploring; a simple idea that I don’t think open world games put enough stock into. Booting up The Witcher again felt like an oddly strange experience for me. The last time I had played in over two years ago, I was at a completely different point in my life. I had a lot more time back then to spend all day after work or on the weekends to just sit down and get through everything a game like this has to offer. Now, I have a house that I’m constantly working on, a new puppy and kitten which requires its own time investment and am now married which explains itself I think. I already felt myself budgeting my time at the thought of going through the entire game again. My original goal was to play through until Smash Bros. comes out in December, but suddenly, even two months didn’t feel like enough time. Cue fifth internal crisis of feeling old this week. Once I finally got past that, everything felt familiar. I remembered the opening cut scene with Yennefer and the dream-state tutorial that follows at Kaer Morhen. Memories of these characters relationships between one another came rushing back to me as I got further in. This was my first Witcher game, something that I was worried about jumping into without playing the first two iterations. You always worry about things that you had missed from previous games and the feeling of just being lost overall. That doesn’t happen in this case. You can feel the history, the lifetime of experiences shared together and the bond between the characters. Nothing feels forced, something that carries out throughout the entire game. One aspect I had a rough time with involved controlling Geralt. I’m not sure if this feeling was enhanced because I had just come off playing Horizon, but Geralt felt very clunky and still did for me after getting through White Orchard. As far as starting areas go, White Orchard is a great representation of what’s to come for the player. You’re introduced to just about everything you’ll run into; character driven quests, liberating locations, destroying monster dens, places of power, Gwent, crafting, chasing down enemies on your horse, large beasts and more. I typically don’t enjoy the notion of starting area’s in video games like this, but you can really see that CD Projekt Red wanted to ease the player into the experience as much as possible. White Orchard caps off with a battle against the big beast of the area, the griffin. Being my second time playing through White Orchard, the fight with the griffin felt very lackluster this time around, and I feel that’s partly due to Monster Hunter World. The griffin basically has two phases and splits off to a new area once his health is low enough. You chase him down, finish him off and take your trophy with you. 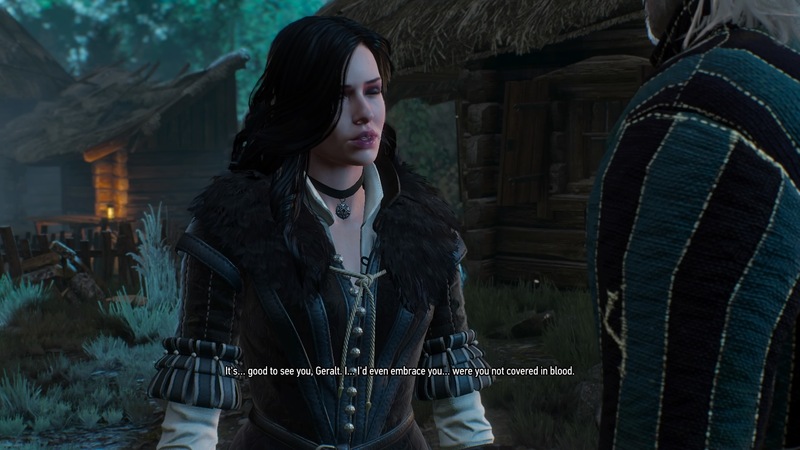 Once you complete White Orchard, you greet Yennefer, meet with the Niflgardian emperor Emhyr var Emreis, gain your objective for the remainder of the game, and you’re off to the hanged man’s tree. 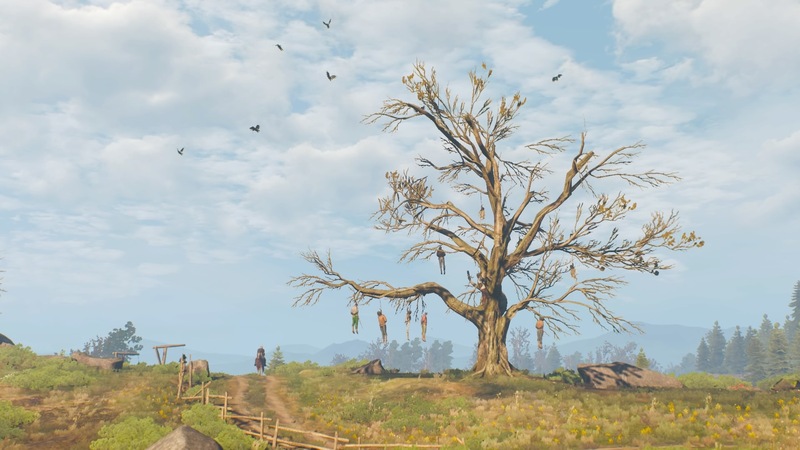 The hanged man’s tree reveal is one of what I call ‘Fallout 3’ moments. The moment that you walk out of the underground vault, after being locked inside and having your character literally grow from a baby into an adult, is one of the best moments I’ve experienced as a gamer. When the vault door opens, you see a flash of light as your eyes adjust to seeing sunlight for the first time. Once everything focuses, you just see….destruction, a wasteland. This shot is one of those moments. We’ve spent over an hour playing through a fleshed out dream-sequence in Kaer Morhen and White Orchard. After seeing all of the care and personality strung throughout those areas during my first playthrough, I couldn’t believe there was this massive world filled with more of the same. It was just excitement to dive in and check out the rest of what The Witcher had to offer, and it didn’t disappoint.